Hello ASTers. Since I started into making models with lights, I've struggled over how to run power from the stand to the model. Today I bashed away at something new, that's inpired by something I saw here on AST. 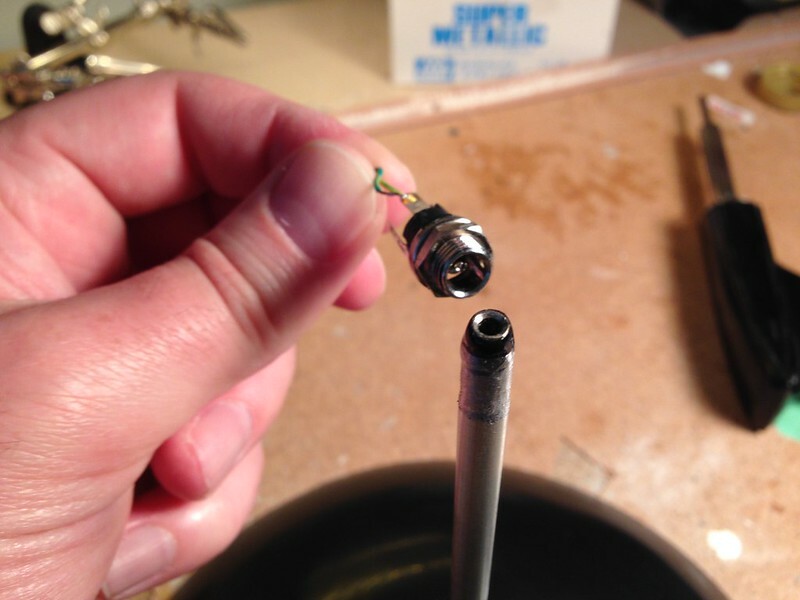 I can't find the post now, and I don't know who did it, but somebody built a stand with the female side of an RCA audio connector on the end of a support rod, and it matched with the male plug inside the model. Power connection made. Genius, whoever you are, unknown ASTer. 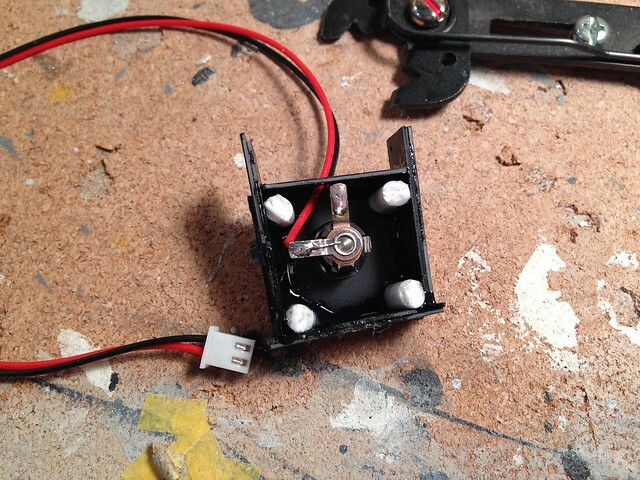 This is basically the same thing, but I turned the end of the rod into a standard 2.1mm DC power plug. The reason I'd do this over the RCA plug is because 1) the physical connection is stronger, 2) the connectors are designed for power, and 3) the tip fo the support rod looks better. Have you read this far and you still don't know what the heck I'm talking about? Pictures are worth a thousand words! I built mine into a Polar Lights "large" dome stand. The steel rod is hollow, which makes this whole thing possible. I drilled a hole near the edge to admit a 2.1mm power jack. The back end of the unit has screw terminals to make hookup easy. 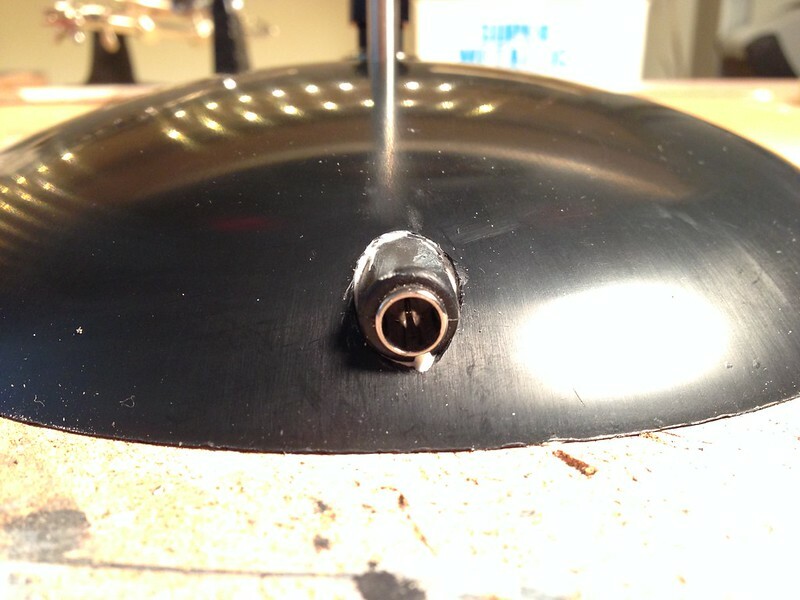 I drilled a hole near the support rod and mounted an old-school toggle button. I love the hefty *CLICK-click* feel of these old things. Obviously, you'd choose a switch that best matches the theme of your model. 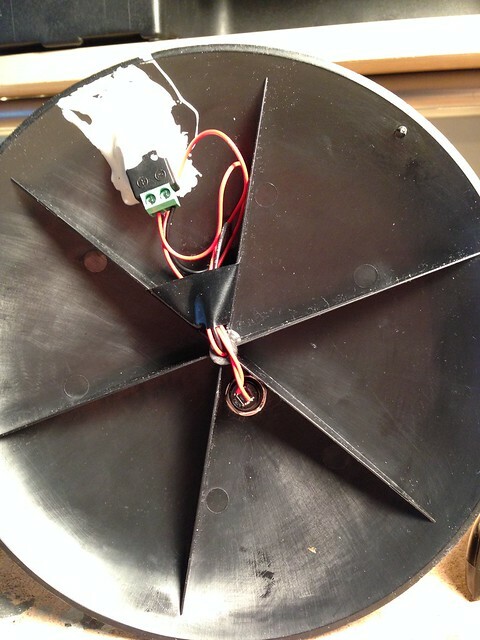 Here's the underside of the base. At the top of the photo, you can see the back side fo the power jack and its screw terminals. I used a ridiculous amount of epoxy glue. That sucker's not going anywhere. Opposite is the switch wired onto the positive (red) wires, then the wire goes up the support rod to the top end. The negative (black) wire is attached to the bottom of the support rod, so that the rod itself is grounded. And here's the business end. 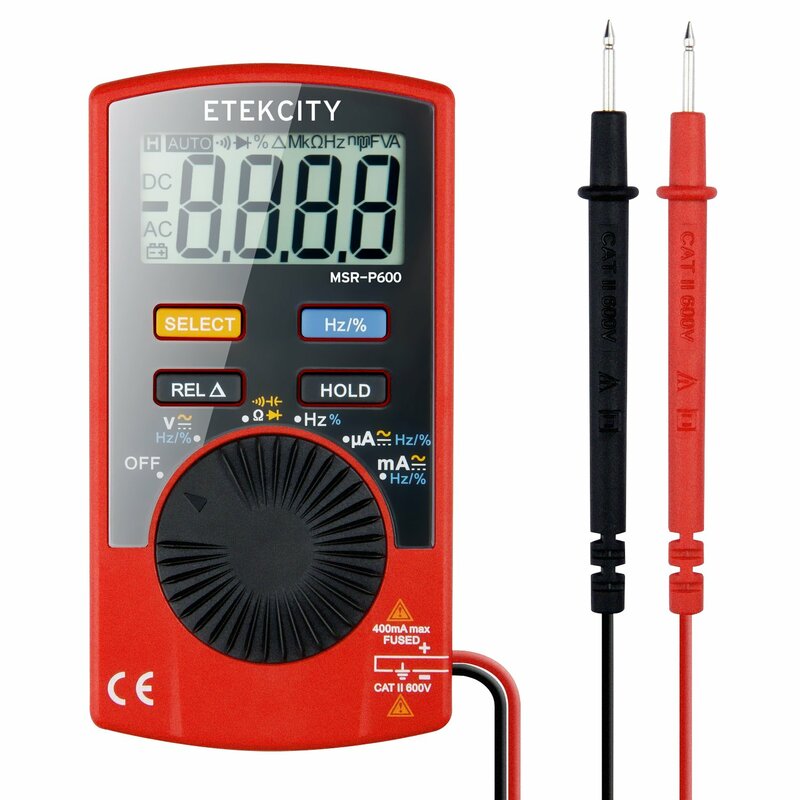 I pulled the cylindrical tip connector from a 2.1mm power plug and soldered it to the end of the positive (red) wire. There's a plastic doughnut and sleeve to keep it from contacting the support rod, which is now grounded (negative). The tip also had to be filed down by about a millimeter. Now it's shaped just like a standard 2.1mm plug. The socket is a panel-mount variety, so I'll mount that inside the model somewhere directly above the hole somewhere near the top of the model. 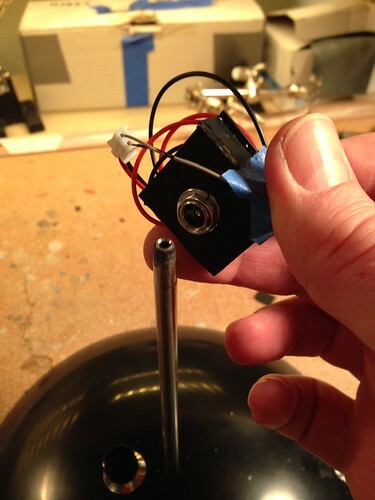 The rod slides in the bottom of the model, enters the power socket at the top, and the electrical connection is made. Bzzzt. Tested. It works! I can post a photo, but this particular stand is for a non-Trek model. Let's just say it's a ship that only goes "point five past light speed". Here are some photos of the power jack side of things. This unit is installed inside the ship with the jack facing down. The wiring is straightforward. 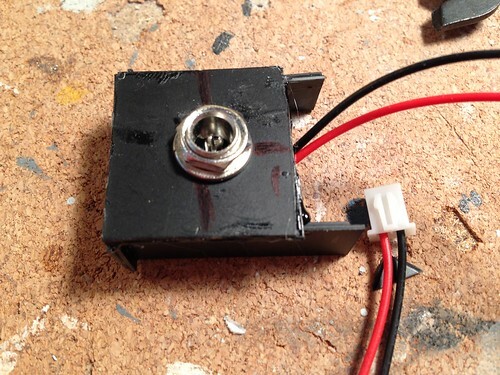 I've soldered a power connector to the positive and negative terminals. Yeah, the enclosure is a bit rough, but who's going to see it, right? 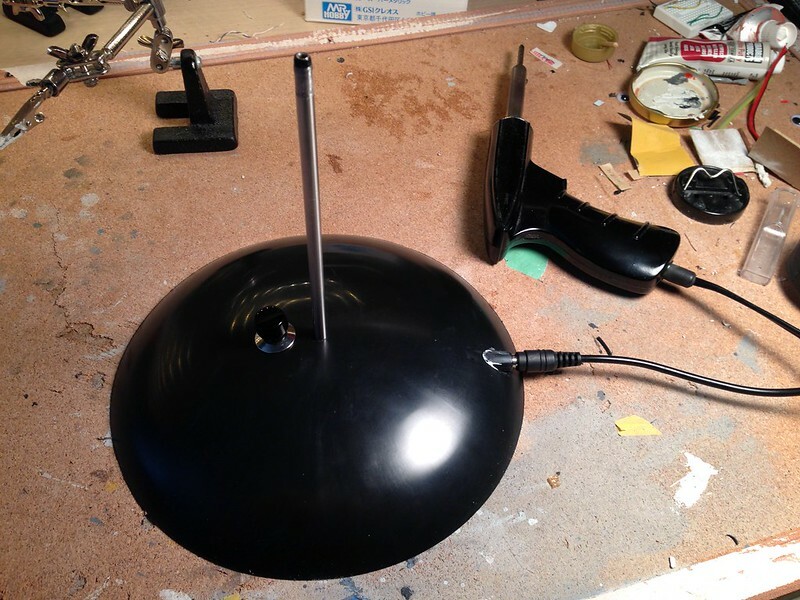 The jack enclosure (which will be installed inside the model) slips easily onto the support rod, which provides power. The tip is the positive terminal, while the rod itself is negative/ground. 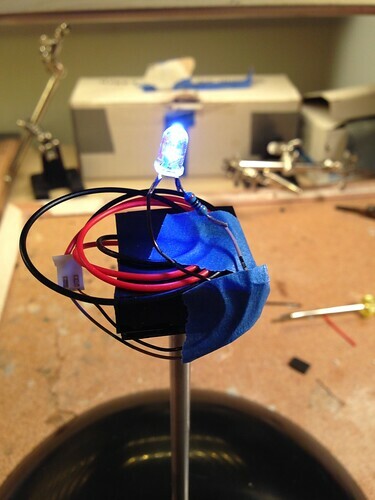 I added a single LED for testing/demo purposes. Cubey Terra wrote: Tested. It works! I can post a photo, but this particular stand is for a non-Trek model. Let's just say it's a ship that only goes "point five past light speed". OK, well... here's the thing. If any of you plan to do this, wait until I figure out why it stopped working reliably. 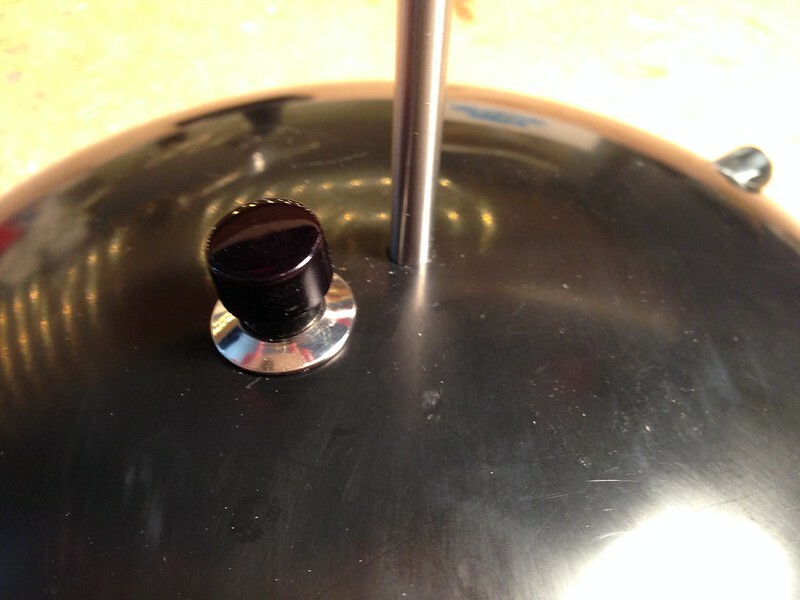 I suspect the tip isn't making solid contact with the spike thing inside the jack. After I sit and stare at it for a few hours, I might have an idea. Where's Scotty when you need him? A multimeter would come in handy at this point. Moongrim wrote: A multimeter would come in handy at this point. Yup, got one of those, and I'm making good use of it. I think I need to make some more to the tip of the support rod. I'm going to make this work.